Everyone who owns an iDevice, or any other brand of smartphone or tablet, knows how hard it is to keep the touch screen clean of fingerprints, oil, and any other “ick” that makes its way onto the screen. Instead of fighting the never-ending cleaning battle with messy sprays and cloths, why not try the SmartKlear and SideKick by LensPen? SmartKlear and SideKick use activated carbon molecules which have a unique ability to absorb huge amounts of oils and contaminants. The carbon doesn’t dry out, nor is it affected by temperature changes. As the cleaning cap is removed and replaced from the SmartKlear or SideKick the carbon compound on the replaceable cleaning pad is recharged, ready for the next use. Slide the pad over the screen; fingerprints and oils magically disappear. The SmartKlear and SideKick‘s small size means you can always have it with you in your pocket, bag, or backpack. The demonstration was impressive, and it sounded like a winner, but would it work for me at home? I’m happy to report that it did, with flying colors. However, there is one caveat: the SmartKlear and SideKick do not work too well with screen protectors. These products were made to use directly on glass. I removed the screen protector from my iPhone, and cleaned the glass with the SmartKlear. I love it! I can actually see the screen now! Plus, the glass stayed fingerprint-free longer, a huge benefit. The SmartKlear and SideKick are inexpensive, at $9.95 and $19.95 respectively, and recommended to easily keep your phone and tablet screens clean and oil-free. The SmartKlear gives approximately 300 cleanings, while the SideKick pad should be changed between 150-250 cleanings depending on tablet size. Replacement pads are sold for both either separately or with the SmartKlear or SideKick. LensPens also has products for cameras and laptops, though I’ve been using the SideKick to clean my MacBook screen. Find LensPen products on their web site or at retailers like WalMart, Best Buy, Amazon, and B & H Photo. 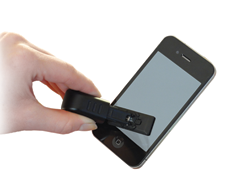 If you hate fingerprints and dirty iPhone and iPad screens, check out the SmartKlear and SideKick. To see the SideKick in action, click here.